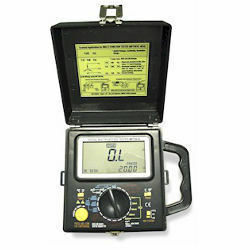 Bright Medi-Weld Appliances excels in rendering a qualitative range of Digital Earth Tester, which is offered to the clients at leading market prices. The Tools are highly appreciated by Construction Engineers, Professionals, Students, Researchers, Govt.Agencies etc. We have a range of latest Engineering Tools which are Simple to use, Less Time Consuming, Accurate & suits your application. High quality Taut Band movement. 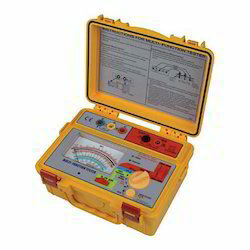 Capable of measuring earth voltage (Vac). The timer operates automatically for about three to five minutes when the "PUSH BUTTON SWITCH" and " Timer On Button" are pressed together. This will keep test "ON" for the duration of the timer. Battery replacement can be easily made without removing the caring case. 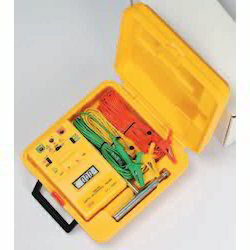 IEC 1010 CAT II 30V. 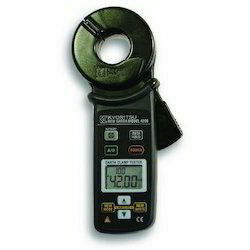 Calibration performed with supplied test leads. Noise Check Function :A function to detect current, which effects on an earth resistance measurement and display "NOISE" mark on the LCD. Memory function :Save and display up to 100 measurement data. 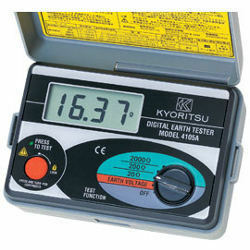 Capable of measuring earth voltage. 2mA measuring current permits earth resistance tests with tripping earth leakage current breakers in the circuit under test. 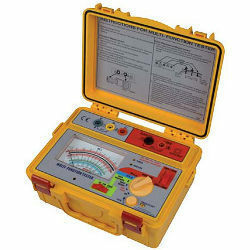 Test leads are supplied as standard accessories for simplified two-wire measuring system. Two insulation test voltage (DC) : 250V and 500V. IEC/EN 61010-1 CAT III 600V. The timer operates automatically for about three to five minutes when the "PUSH BUTTON SWITCH" and "TIMER ON BUTTON" are pressed together. This will keep test "ON" for the duration of the timer. wire measuring system also supplied as standard accessories. Designed to meet IEC 61010-1 safety standard. Automatic warning when resistance of auxiliary earth spikes is in excess of tolerance. Small and lightweight. Shock resistant new case material. 2mA measuring current permits earth resistance tests without tripping earth leakage current breakers in the circuit under test. In addition to the facility for precision measurement, test leads for simplified two wire measuring system also supplied as standard accessories. EN 61326, EN55011, EN 61000-4-2, EN 61000-4-3. Looking for Digital Earth Tester ?